from the scallops in a Florida bay, to important decision-making agencies on Long Island. This is why The Nature Conservancy (TNC) finds the work of Jimmy and his colleagues very useful. A nonprofit organization, TNC works toward the long-term conservation of “lands and waters on which all life depends.” TNC conservation scientists Nicole Maher and Carl LoBue rely on Jimmy’s expertise on salt marshes to make informed decisions about important reactionary and preventative measures in the face of climate change. 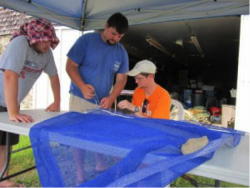 Jimmy’s research involves food-webs, also known as ‘who eats what’ in an ecosystem. 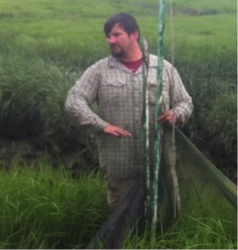 In salt marshes, smaller fish are an important part of the food-chain, linking the plants they consume to the fishery resources we depend on for food and recreation. Unfortunately, salt marsh habitats that support these vital links in the food-chain are threatened by man-made nutrient pollution. Nutrient pollution is the release of excess plant nutrients (typically nitrogen and phosphorus) to bodies of water like rivers, lakes, and the ocean. These nutrients are the same fertilizers used to keep lawns green and grow robust crops, however, in excess they can cause significant damage to natural systems. Though nutrient pollution is not widely discussed, it is one of the most widespread and pressing environmental issues we face today. Jimmy has been interested in this line of research since childhood. Having grown up in Florida, Jimmy loved snorkeling in search for scallops in a nearby bay. Unfortunately, the scallops began to disappear not long after a golf course was constructed nearby. Jimmy understood that the golf course caused the scallops’ absence, but he couldn’t quite grasp the details, beginning a long-term interest in water ecology. Now Jimmy can put this fascination to good use with his involvement in the TIDE project in Plum Island Sound, MA. 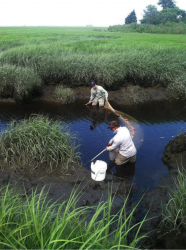 The TIDE project is a one of a kind large scale experiment that aims to pinpoint the repercussions of excess nutrients on salt marsh ecosystems. The TIDE project, initiated and maintained by Linda Deegan of the Marine Biological Laboratory, has held a crucial role in reshaping how scientists understand the effects of nutrient pollution in the coastal ocean. When The Nature Conservancy Senior Coastal Scientist, Nicole Maher, noticed that the salt marshes she was working with on Long Island, NY were degrading, she had the opportunity to consult researchers from TIDE who let her know that the scientists on Plum Island were seeing the same symptoms. This vital communication between scientist and stakeholder allowed Maher to keep local decision makers updated on how the salt marsh would likely change with added nutrients, using the research from TIDE as a reference. The information that Jimmy collects on Plum Island is also used in detailed state documents that inform funding decisions made by state officials. Senior Marine Scientist at TNC, Carl LoBue has been spearheading these funding justifications, using TIDE to help inform smart decision-making at the County, State and Federal levels. “It’s important to let people know that projects like TIDE are major factors in how decisions in funding resources are justified. This information is being applied in a very real way.” Explains LoBue. Millions of dollars are being directed towards water projects that have been made possible by information from the TIDE project. Steven Bellone, the Suffolk County Executive, has even declared nitrogen “Public Enemy #1,” drawing the much-needed attention to water quality issues and influencing funding to relevant projects. Jimmy has recently taken a position at University of Louisiana as Associate Professor. We'll miss you, Jimmy! Written by NE CSC Communications Intern Annabeth Kelley.